JQ Talks: MIZZUE: Expensive Bags That Never Seem To Arrive. Mizzue, the name that every bag searcher heard before as they constantly stick their FB sponsored post on your FB feed, making sure you know well that they are having different buy 1 free 1 bags every day. I once reviewed their brand, read them here, it's interesting how their shipping was so on point when it was a blogger review item but when I finally decided to order from them as a customer, I was utterly disappointed. You know what's funnier, for a brand that sell bags at such a high price point, I would have expected for them to be better in terms of everything. I've been eyeing on this bag for a really long time, ever since I was reviewing their bag. Early last month, I caved after seeing the sponsored post on FB that stated buy 1 free 1. Long story short, I managed to find a friend to buy this bag with me. Excited me thinking that I'll receive my bag latest in 2 weeks was truly just wishful. 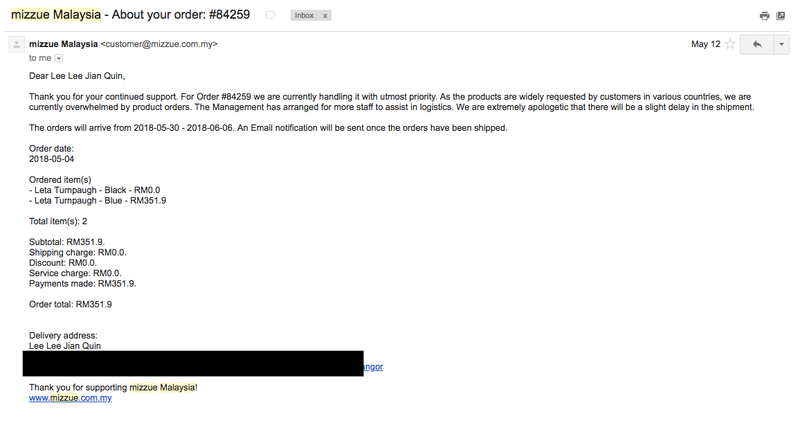 A week after my purchase, I received an email stating that they are overwhelmed by the amount of orders and order will only arrive around 3 weeks time. My hopes of using this bag for a trip went down the drain. I'm sure it's not their first time doing Buy 1 Free 1 promotions, Mizzue should be an expert and expected such crisis by now. Clearly, they didn't care as long as money comes in first, product delivery talk later. 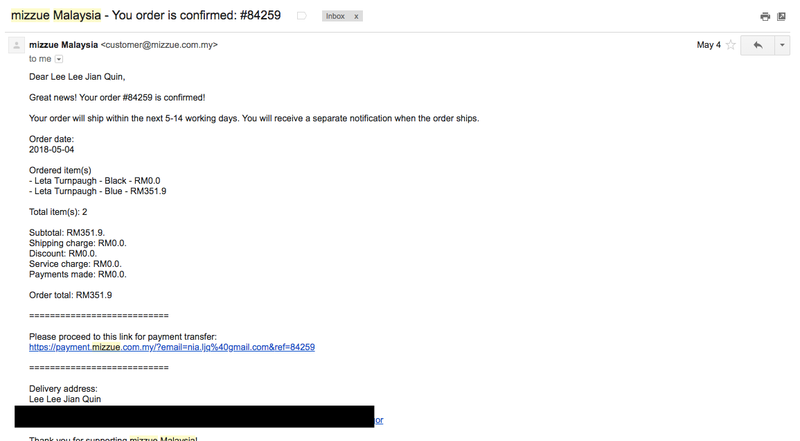 On the 5 June, I received another email stating that my order has been shipped. I thought to myself "FINALLY" but it wasn't the end unfortunately. I've waited, and waited, I got worried on 10th June as I don't want delivery people to send it back to the company. 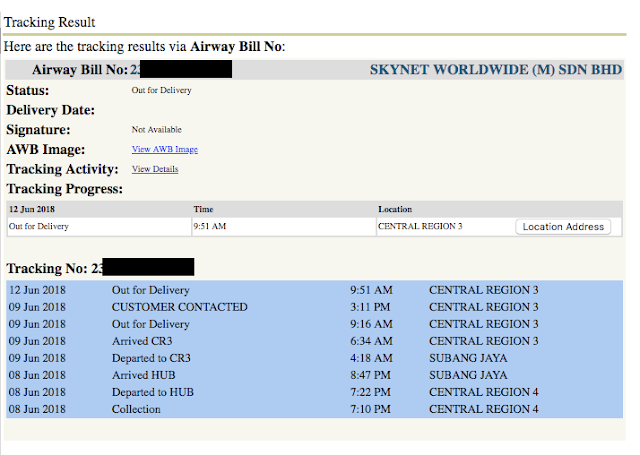 So I checked on skynet with my tracking number, true enough, apparently my parcel was sent on 9th June but I wasn't in (I was at home till 5pm) and apparently I was contacted about my parcel (I did not receive any call or message or notice paper in my mailbox about my parcel). I called them on 11th June morning, number on the website does not work, had to google their HQ number and call them there to get the number for Subang Jaya brand. Called and was on hold for a long time before someone picked up, thankfully she was polite but wasn't very helpful as I was told to wait for her to call back, she didn't :( I called back in the afternoon, again waited a long time before someone picked up, another friendly staff that helped me to get the parcel deliver again the next day. Having experienced failure delivery failure even at the 2nd attempt, I'm not taking any chances. I called again on the 12th June at 11am, walau, again they say I wasn't home (I was home btw) when I didn't even receive any notification from my guardhouse or a call or a text about my parcel. Thankfully, this time the staff called me back again to inform me that the deliveryman will send again before 6pm today. As usual, a vague answer, from 11am-6pm. All so familiar to me, I once did the same, staying home all day and ended up parcel still didn't arrive that day when I was told it would. Seriously, this is ridiculous. Paying so much to Mizzue when they can't even ensure their paying customer are getting the best shipping service and somehow must be "understaffed", constantly overwhelmed and not enough bags to deliver on time (there are many examples online, just google, many complained before and Mizzue did nuts about it), making customers wait, and wait. Let's just hope that this bag arrives today as promised so I can move on with my life. Have you experienced such unfortunate incident before? The delivery guy finally called. Finally. He was polite when he delivered. The package arrived safely and in good condition, no tears, no rips. Now, I finally can go sleep in peace.